I know that the Scots probably don’t care much about American football, but it seems to me that their Isle of Mull Cheddar was made for the Super Bowl. A cheddar with flavors of mustard and malt? Score. 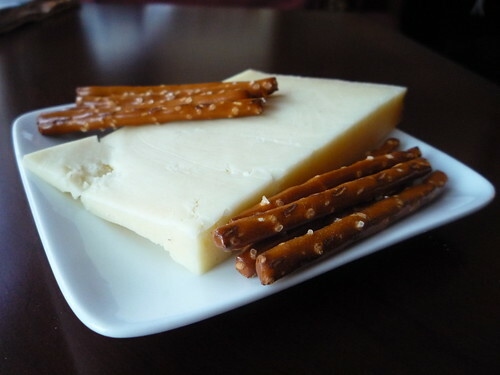 The mustardy flavor of Isle of Mull Cheddar makes it an ideal match for pretzels – and football. What gives Isle of Mull Cheddar its distinctive flavor? The cheese’s island namesake, located off the western coast of Scotland, is home to the Tobermory malt whiskey distillery. The cows that supply the milk for this aged raw-milk cheese feast on the distillery’s leftover fermented barley, which in turn give the cheese a Scotchy taste. Once brought to room temperature, the Isle of Mull Cheddar has a mustardy aroma that intensifies with each bite. Bring on the pretzels! As you might expect, Isle of Mull Cheddar is a natural match for Tobermory Scotch, but for those of you who aren’t planning on breaking out the hard stuff during the game, consider serving the cheese with a Pinot Noir or, as Jamie Forrest of Curd Nerds suggests, a California Chardonnay. But let’s be realistic – you’ll be serving it with beer for the Super Bowl. In that case, DiBruno Bros. suggests an ale. Special note: Isle of Mull Cheddar has also been toddler-approved. My 1-year-old son couldn’t get enough when he spotted some on the counter yesterday. The Queso Files from DiBruno Bros.
CheeseandChampagne.com by C.Levine/J.Lewis is licensed under a Creative Commons Attribution 3.0 United States License. Permissions beyond the scope of this license may be available at http://cheeseandchampagne.com/about.